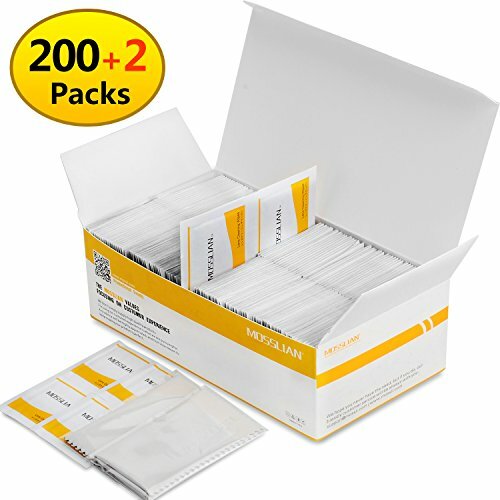 Package includes 200 individually packaged lens cleaning wipes. Warnings: On glossy surfaces, test a small area first. Single use only, please use new wipes as needed. A dirty or dry wipe can scratch. Keep out of reach of children. Not for use on contact lenses. Avoid contact with the eyes. If contact occurs, rinse eyes thoroughly with water. ✔ Lens Cleaning Wipes is suitable for smartphone, CD, watch, glass, lenses, mirror, screen. A microfiber cloth is required as part of the eyeglass cleaning regimen to completely remove any remaining haze associated with the wiping process. After completion of this second step, the eyeglasses are clean and bright with no haze or streaks. ✔ Safe and effective: Wipe away bacteria, dust and oil with just a swipe. No fibers or lint behind. Leave no residue. ✔ Convenience: Disposable pre-moistened wipes make it quick and easy to safely to clean lenses. One step, no hassle. ✔ Individually-wrapped wipes: It can reduce the maximum your valuable space with simple, ultrathin, compact design. ✔ Usage: Gently brush away dust and dirt with the folded wipe. Unfold the wipe and gently clean the surface with circular movements until the surface is clean and dry.